Congratulations to Nephew Dylan who graduated from Laurentian University this fall. Good luck Dylan. Congratulations to Mika and Matt on the purchase of their first new home. Also congratulations to Jana who also purchased her first home. Congratulations to Niece Tanya Charette and her beau Justin who became engaged and will be getting married in the fall of 2011. Congratulations to Niece Michelle Gendron and her beau Travis who became engaged and will be getting married in the summer of 2011. 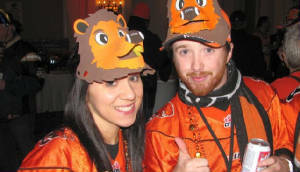 Congratulations to Neice Monique Gendron who, (with the help of her many friends and family) was named BC Lions fan of the year. She gets an all expenses paid trip to the Grey Cup in Edmonton with field passes and access to VIP parties. It's too bad that the BC Lions didn't qualify this year....However, they played the best game ever!!!! !